You are browsing the Blog for success_story. 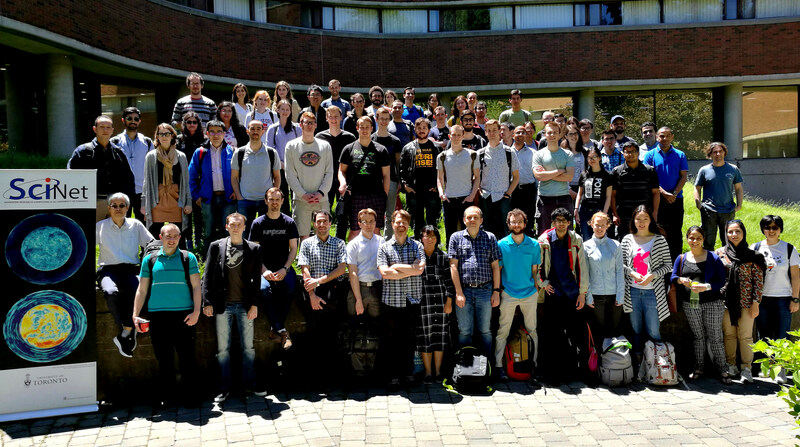 When summer arrives, it means the return of Ontario’s Summer School on Scientific and High Performance Computing. This annual set of educational events bring together graduate students, undergraduate students, postdocs and researchers and gives them an opportunity to learn and share knowledge and experience in technical computing, data science and biomedical computing on modern high-performance computing platforms. The summer school has been given at three locations for the last seven years and is a collaborative effort of the three High-Performance Consortia in Ontario: SHARCNET, CAC, and SciNet. 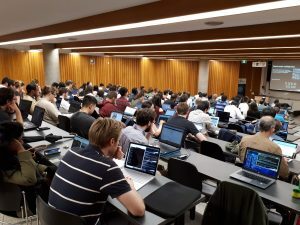 This year, the first was from May 28 to June 1 in London, while the second one was hosted by SciNet on the St. George campus of the University of Toronto from June 11 to 15, and the third will take place in Kingston from July 30 to August 3. The format of the school is that of a five-day intensive workshop with mixed lectures and hands-on sessions on a number of selected topics. 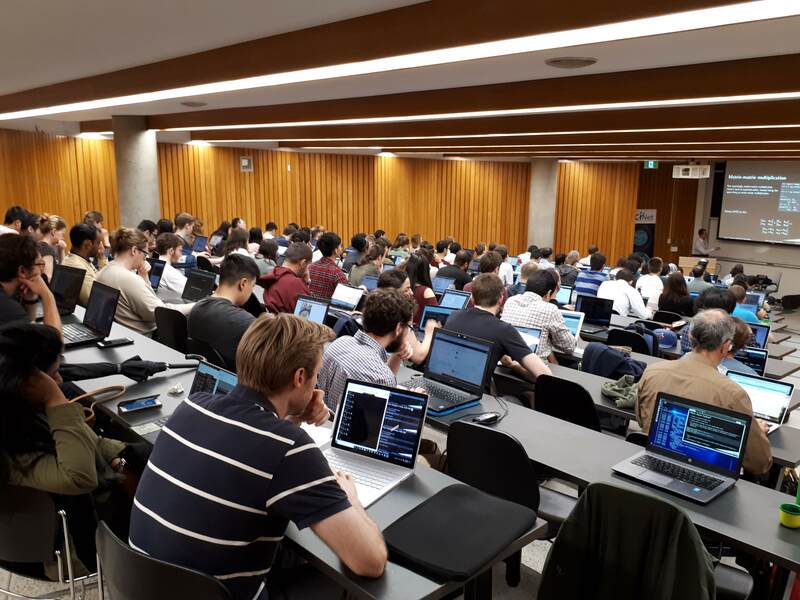 The topics slightly vary by location, but may include shared memory programming, distributed memory programming and general purpose graphics processing unit programming, and Python, R, machine learning, neural networks, visualization, debugging, bioinformatics and bioimaging. To make all these topics fit in one week, the lectures are organized in different streams. In Toronto, there was a high performance computing stream, a data science stream, and a biomedical stream, given by instructors from SciNet, SHARCNET, and CAMH. This year was SciNet’s biggest summer school yet. For the first time, there were more than two hundred participants, from widely varying academic background like Business Administration, Dentistry, Biology, Medicine, Economics, Health Sciences, Phyics, Chemistry, Engineering, and Astronomy. 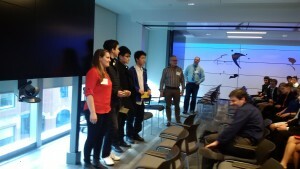 Those who attended at least three days received a certificate of attendance. 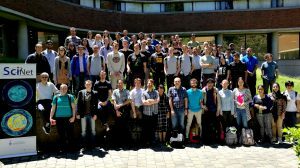 To get a sense of the tremendous growth of this event, consider that in 2012, one of the first years of the summer school, in Toronto, we had 35 participants in the summer school, issued 20 certificates, and a total of 400 contact-hours were delivered by a handful of instructors. In 2018, these numbers are 7 to 10 times larger: there were 211 participants, 135 certificates were issues, and 3800 contact-hours were delivered by 17 instructors. If that is not a clear enough indication of the demand for this kind of training, consider this: within one day of opening the registration, there were over 100 registrations, and just one week later, the 200 registration mark was crossed. There were people on the waiting list, although we made an effort to try and accommodate most people in the end. The school is offered for free, but without support for travel, lodging or meals. 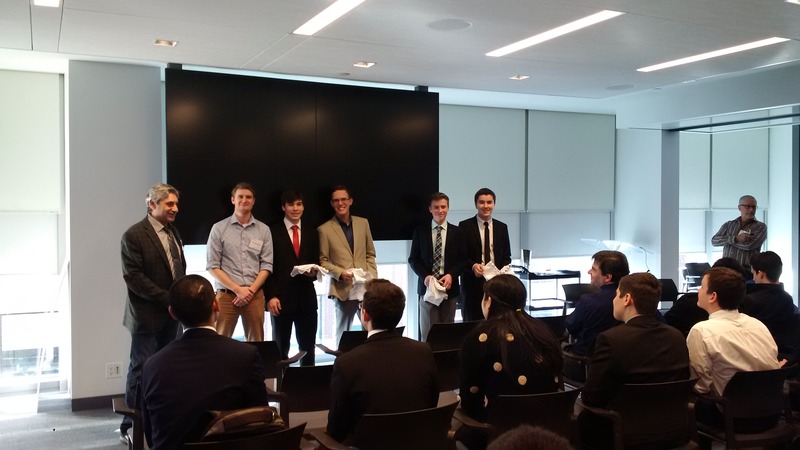 It is therefore not surprising that most participants are from the Toronto area, but there was a sizeable number of attendants from outside Toronto (60), from outside of Ontario (15) and even from outside Canada (5). The participants seem to really appreciate the event, as borne out by the preliminary results from the post-event survey. From the survey, we got suggestions for improvements for the future, such as (even) more hands-on and better explanation of prerequisites and software for the sessions. Nonetheless, 94% of the respondents was very satisfied with the summer school, and thought the overall value of the summer school was high. 92% would recommend the event to their peers. Interestingly, the answers to the question “What was the most important thing you learned or did during the summer school?” varied a lot, indicating, perhaps, that the broad range of offered topics allowed participants to pick what suits them best. Organizing the school was a tremendous experience, made possible by 8 instructors and staff members from SciNet, 9 from CAMH, and 2 from SHARCNET. The University of Toronto provided the space for the session, while Compute Ontario sponsored the coffee-and-cookie breaks. If you missed it this time, look for the announcement next spring of the 2019 Ontario Summer School on High Performance Computing. We congratulate the LIGO and Virgo collaborations to the second-ever observation of gravitational waves from colliding black holes. SciNet is proud to have contributed to the computation of the waveform templates that were used in this latest discovery of LIGO. LIGO measured about 55 gravitational wave cycles for this new binary black hole system. This large number of cycles made detailed computations of the expected wave-shapes more important than for the first detected black hole merger that was announced in February. Canada is a leader of numerical calculations of colliding black holes, research led by Professor Harald Pfeiffer, Canada Research Chair for Numerical Relativity and Gravitational Wave Astrophysics at the University of Toronto. 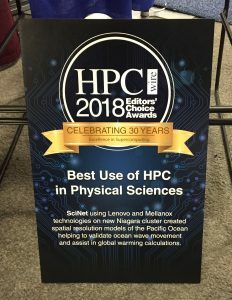 Pfeiffer states: I am very grateful for the sustained support of the SciNet team during the last 7 years; their support and the access to computing time on SciNet’s supercomputers have been crucial for my research program and its profound contributions to the LIGO discovery. Above: The in-spiral and collision of two black holes similar to GW151226. The top portion of the frame shows the horizons of the two holes, in this case, at the moment close to the merger of the black holes. The middle portion of the frame shows the gravitational waveform projected onto the LIGO Livingston detector. The bottom part shows the frequency of the gravitational waves, gradually increasing from about 35Hz to above 700Hz. For this system, LIGO could observe many more gravitational wave cycles than for the first discoved system (named GW150914). Visualization done by University of Toronto Undergraduate student Aliya Babul & Prof. Harald Pfeiffer, within the SXS Collaboration/www.black-holes.org. Comments Off on Gravitation waves detected, again! 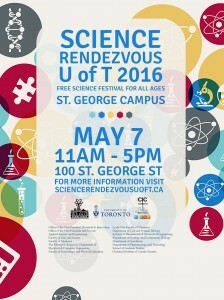 Join us Saturday, May 7th for Science Rendezvous! 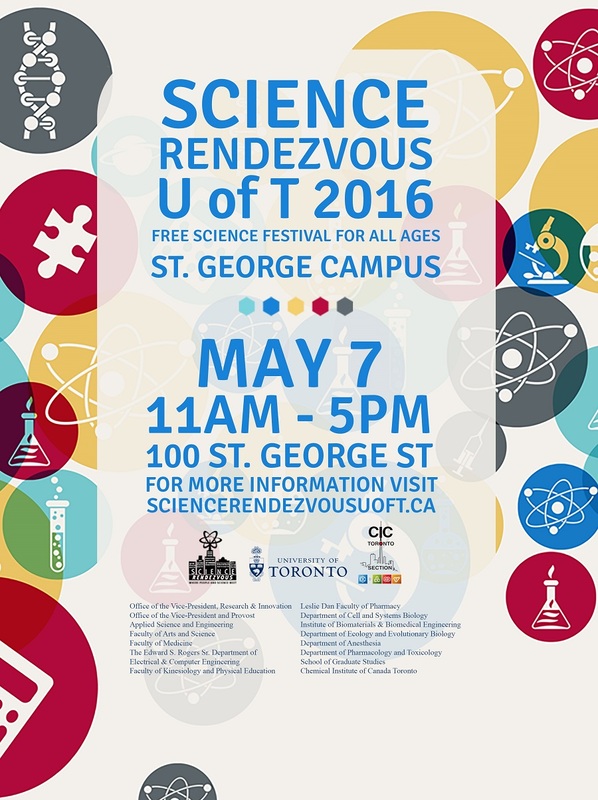 It is an annual festival at the University of Toronto that takes science out of the lab and onto the street. At the SciNet booth, explorers of all ages will find out how researchers use computers for discovery. They will see how simple computer simulations that you can run in your web browser or laptop can reveal important facts about how complex systems behave. Click here for more details about Science Rendezvous and its many exhibitors. On February 11th, 2016 (10:30AM EST), scientists from Caltech, MIT and the LIGO Scientific Collaboration together with representatives of the National Science Foundation, announced in a live press conference, the first direct detection of gravitational waves. The event detected, named GW150914, was produced by two colliding black holes, inspariling and merging together. This signal was detected by LIGO on September 14th, 2015. Many of the researchers running simulations and analysing data in several of our clusters are directly involved in the efforts for accurately modelling, simulating and detecting gravitational wave signals. As a matter of fact, one of the simulations used for visualizing one of the movies screened during the announcement of the discovery of gravitational waves, was performed on SciNet’s General Purpose Cluster (GPC). 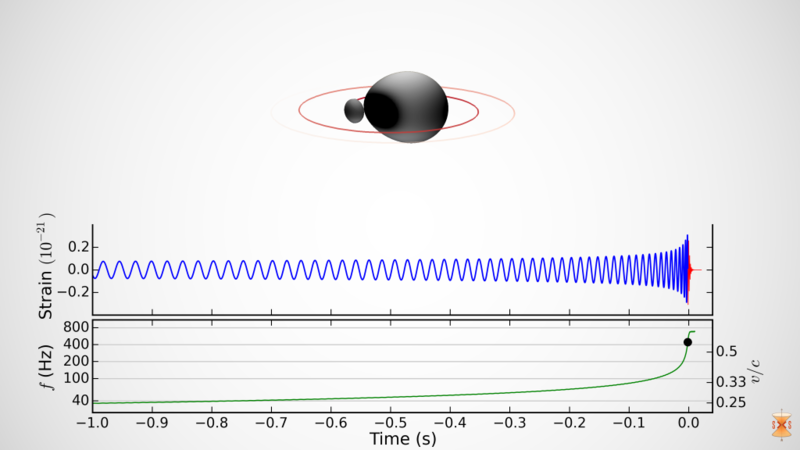 Simulation of a binary black-hole system emitting gravitational radiation (gravitational waves) performed on SciNet’s General Purpose Cluster (GPC). These simulations were performed by solving Einstein’s equations of General Relativity using a code co-developed on SciNet, by the SXS/CITA collaboration. Another of the videos displayed on the press-conf, was also produced by solving Einstein equations using this same computer code co-developed on SciNet by the SXS/CITA collaboration. Comments Off on Gravitational Waves detected!!! 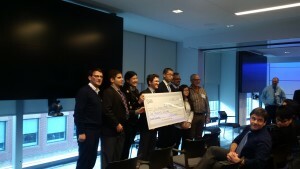 SciNet in partnership with STEM Fellowship (http://stemfellowship.org/), SAS and Open Data Toronto, organized the second edition of the “Big Data Challenge for High School Students”. On Feb. 4th, the 2015/2016 Big Data Challenge for high school students took place. 8 teams from several schools across the GTA presented their research on data analytic in front of peers and judges. Inspired by “Big Data in the City” theme, students gathered data from Open Data Toronto, analysed and investigated topics such as: immigration relocation strategies, emergency response for first responders services, identification of clusters in Toronto, environmental analysis of Toronto neighbourhoods, debt risk analysis of the city, collision patterns and prevention, data mining from social media related to energy efficient companies, among many others. SciNet members, in addition to organize this event participated evaluating the initial proposals and judging the final 8 qualified for the final presentation. Participants of the Big Data Challenge will be participating in tours to SciNet’s datacenter, as an unique opportunity to experience and visit the home of the largest super-computers in Canada! Congratulations to all the participants!!! 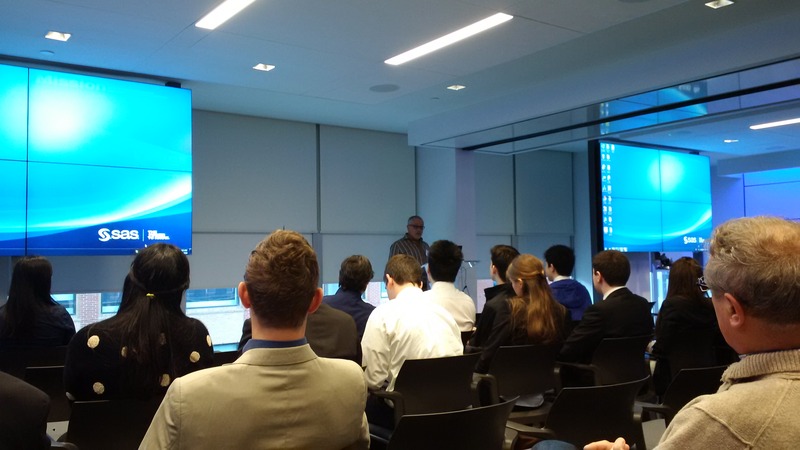 Eighty students from the US, Canada, Europe and Japan, plus about twenty speakers and over thirty mentors gathered at the University of Toronto from June 21 to June 26, 2015, to learn about High Performance Computing, and share experiences in this multi-disciplinary field (see https://ihpcss2015.computecanada.ca). Sponsored by PRACE, XSEDE, Riken, and Compute Canada , this was the sixth such advanced international summer school on High Performance Computing, which targets graduate students and postdocs who already have some experience in HPC parallel programming (for instance, MPI, OpenMP, or CUDA/OpenCL), preferably on software used in successful research projects. Leading American, Canadian, European and Japanese computational scientists and HPC technologists offered instruction on a variety of topics, including HPC programming proficiencies, performance analysis, and visualization, as well as presentations of how HPC gets applied in fields such as geophysics, climate science, material science, cosmology, plasma phyiscs, and life sciences. SciNet, a partner in the Compute Canada endeavour, was encited to be the local organization of this large international event. 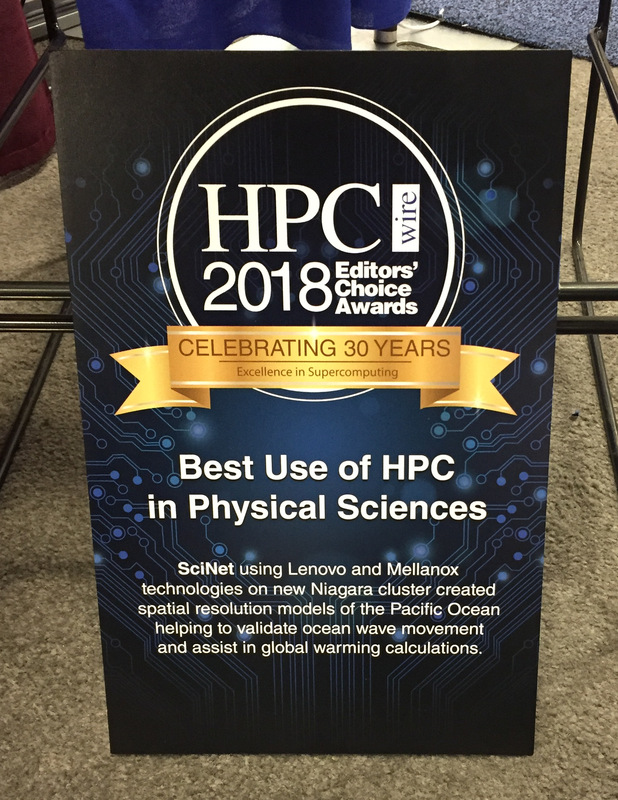 It was an engaging week of instruction and networking that we hope has given the participants the skills and inspiration to use HPC resources to explore scientific projects at new and unprecedented scales. When clients have extremely large-scale computations to do, SciNet recommends that they use Intel® MPI Library, a highly tuned, massively scalable communications library that performs well where competitors have trouble even starting. And when Intel was looking to further improve the performance of their flagship MPI library, they knew they could turn to SciNet and its massive cluster to serve as the ultimate testbed. SciNet’s GPC cluster, with four thousand nodes connected by ethernet, is one of the largest flat such networks in the world, and provided an extremely valuable testing facility for tuning the MPI library’s performance on extremely large scales. “Over the years we have worked closely with SciNet to develop and tune our Intel MPI Library symbiotically with their high performance computing applications on their compute platform,” said Sanjiv Shah, Director, Technical Computing Software, SSG, at Intel. Sanjiv Shah, Director, Technical Computing Software, SSG, Intel Corporation. The Intel team used up to 30,000 processors at a time on SciNet’s GPC cluster to test and tune the latest version of their MPI library, released as Intel® MPI Library v4.0, and SciNet users used an early version of the library to run one of Canada’s largest simulations.